What lawyer wouldn’t want to earn higher margins, inspire greater client loyalty, attract and retain the best talent, and gain a competitive edge? According to Dr. Heidi Gardner, a former McKinsey consultant and Harvard Business School professor, now lecturing at Harvard Law School, the key to all these benefits is what she calls “Smart Collaboration.” Based on over a decade of research, her new book, “Smart Collaboration,” reveals these significant tangible benefits for lawyers, their firms or companies, and their clients. I had a chance to speak with Gardner in depth about her research. Here’s what I learned. Monica Zent (MZ): Why is collaboration essential for lawyers? Heidi Gardner (HG): "Lawyers today are more specialized than ever, but their clients’ problems are increasingly complex and multidisciplinary. … What clients want is for their lawyers to understand their issues deeply enough to offer sophisticated advice and to line up the right legal team to deliver it – no matter where in the firm the needed experts reside. My empirical research shows that firms earn higher margins, inspire greater client loyalty, attract and retain the best talent, produce more innovative work, and gain a competitive edge when their lawyers collaborate across boundaries. Individual lawyers benefit, too: working on cross-practice matters helps them develop the knowledge, skills and confidence to tackle increasingly complex, multi-faceted problems. … Lawyers who don’t collaborate risk becoming overly niche players whose expertise will become more and more commoditized." MZ: How were you able to, through your research, connect collaboration with profits? HG: "With a research team including mathematicians and economists, we drew on decades of timesheet, personnel and clients records across multiple law firms—literally millions of data points—to study collaboration and its outcomes. We built statistical models to explore collaboration’s results over time, which allowed us to detect patterns that are impossible for people to observe in daily life. I also conducted hundreds of interviews with clients, law firm leaders and partners, and all sorts of other people in the legal ecosystem to enrich my empirical findings. The business case for smart collaboration across practices is clear: proper execution of smart collaboration increases a firm’s revenues and profits, client loyalty and retention, and innovation, while decreasing risk. Simply put, the more disciplines involved, the better. My research shows that there are very real, tangible financial benefits for firms because complex, multi-practice work commands higher margins, revenues, and rates." MZ: Is your research on the benefits of collaboration just as relevant to in-house corporate legal departments? HG: "The benefits of smart collaboration definitely apply to in-house corporate legal departments. A challenge for many General Counsel involves shifting their mindset from being purely defensive to one that also involves opportunity-seeking. ...Such problem solving requires creativity and collaboration across disciplinary boundaries. Many lawyers have not had formal training on the related skills and the necessary mindset. But... I find that once General Counsel are exposed to the ideas, they find it exhilarating to make this shift..."
MZ: What differentiates "Smart Collaboration" from collaboration that is not effective? HG: "Smart collaboration is a means to an end, rather than an end in itself… In addition to offering up their expertise, these professionals also help, advise, stimulate, and counterbalance each other. By truly collaborating, a team of knowledge professionals is able to address issues than none could tackle individually. Smart collaboration is different from the mere assembly of experts in a “divide and conquer” approach. It’s also different from sequential teamwork, in which one expert builds on others’ prior contributions and then hands the project off to the next teammate. … Further, smart collaboration is not cross-selling, a practice where the lead partner introduces a colleague to his client so that the newcomer can provide additional, discrete services with little oversight or guidance from the original partner. Simply put, cross-selling is the professional equivalent of the McDonald’s tagline: “Do you want fries with that?” and clients hate it..."
MZ: What do you think is the biggest obstacle for lawyers that can inhibit collaboration? HG: "...For some professionals, firm culture, distrust of colleagues, and failed past attempts to collaborate have created a negative feedback loop, which has reinforced the perception that collaboration isn’t worthwhile. … I’ve found that many professionals don’t collaborate because they are simply not used to working on teams and are more comfortable working in competitive, individualistic settings; law school figuratively constructed these working silos, and strong firm cultures reinforced them. Whatever the case, changing their perception of what smart collaboration is – the kind of integrated, sophisticated, multi-practice work that I am advocating for – is the hardest step. … Fortunately, even the most jaded lawyer responds to hard evidence." MZ: How can technology help facilitate "Smart Collaboration"? HG: "Technology can help smart collaboration occur more easily, especially as virtual teams expand across the globe… it can help make performance management powerful and palatable, if not fun. [Technology that] promotes both ownership and transparency [among team members] combined with a search function to generate more collaboration opportunities can be useful... Others on the team can see progress, which acts like a motivating success story. I predict that it will become indispensable as technology-savvy professionals rise through the ranks." MZ: What is next for your research? Two topics have been on my research agenda for a while… First, I’m taking a deeper dive into examining the relationship between collaboration and gender... Secondly, I am focused on gathering data to understand the long-term outcomes of professional development initiatives aimed at fostering collaboration; we want to demonstrate which efforts have the greatest impact on partners’ behaviors and business outcomes. 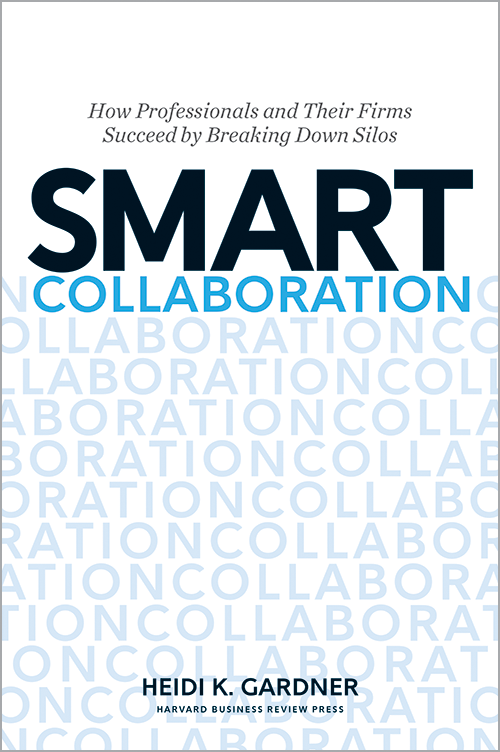 I’m passionate about continuing to advance the ideas in “Smart Collaboration” because I think they can truly, positively affect people’s experiences of work and their colleagues, as well as their productivity and profitability." This piece was originally published on Inside Counsel.